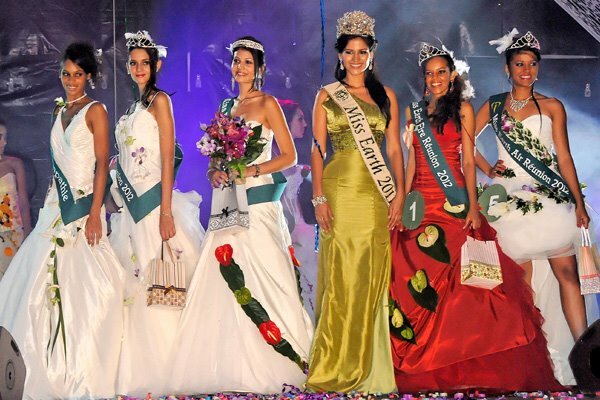 22 year old Aisha Valy (photo holding bouquet of flowers) from Entre-Deux won the title and the crown of Miss Earth Reunion 2012 during a competition held last April 1 in Sainte-Clotilde Exhibition Centre. Anais Sadeyen was declared as Miss Fire. Estenie Sadeyen was Miss Air, and Solenne Abarnou won Miss Water. Aisha will represent Reunion in the Miss Earth 2012 to be held on December later this year. 10 lovely contestants all over the French island have competed for the contest. Attending the event as a special guest was the reining Miss Earth 2011, Olga Alava of Ecuador.